Unless you live in our southern most states, odds are you will find it necessary to winterize your boat until spring. Of course the length of winter varies in different areas, but generally, you’re looking at about the same procedure whether it’s two months or six months. Obviously, the easiest and most fool-proof way to winterize is to take it to your local dry-storage marina, but that means being at the mercy of their schedules come spring. Plus, us boaters are a hands-on, do-it-yourself breed, so consider the following tips and do it yourself. You might save yourself money, and when the first HINT of spring comes, you’ll be ready to launch in a moment’s notice. This is not meant to be a comprehensive list of the proper steps to winterize a boat. There are different kinds of boats, in both freshwater and saltwater, with both gas and diesel motors, in many different styles, with different types of marine carpets, etc, etc. Please check your engine manual for a step-by-step checklist for your particular motor. That being said, here are some tricks of the trade to keep in mind. It’s critical to add premium gas stabilizer and to have a full tank of gas after your final outing; the ride home will mix thoroughly. Treat your motor to a well-deserved oil change. Also change your oil filter, water/fuel separator, in-line filters, and whatever other changeable component you can change. If you do it all, you’ll always know exactly something was changed last. About the only changeable components you want to save for spring are your spark plugs. However, go ahead and buy your new set while you’re buying all of your filters. Verify size by comparing the ones already in your engine. If you don’t have a closed cooling system, you need to make sure you’ve got water available to run through your motor when you’re putting your boat away for the season. Typically, this is accomplished by using Muffs (aka Rabbit Ears) on an I/O drive or a flushport hose connection on an outboard. Do NOT run your engine without water circulating or you may be decommissioning for good. The next step (on fuel-injected engines) is to crank the engine (not start) and spray a preservative (aka Fogger) into each cylinder via the spark plug port. If you’ve got a carbureted engine, spray the fogging compound into the carburetor with the motor running (with water circulating) until the engine chokes and stalls. You’re trying to distribute the fogger completely throughout the engine. Remove your battery before stowing your boat away, but make sure it’s the very last thing you remove from the boat. Otherwise, you will have forgotten to raise your outboard or outdrive to the up. Store the battery in a warm, dry place, preferably close (but not too close) to an electrical outlet. This will give you an easy way to put your battery on a trickle charger about once a month to have it ready to go. Without a doubt, the single most potentially damaging thing to your boat in the off-season is, ironically, water. It will lead to things like mold and mildew and do serious harm if allowed to find its way into tight areas and expand as it freezes. Do yourself a favor and invest in a great cover with an internal bracing system. Most of Corinthian Marine Carpet dealers can provide this service for you. Or you can pay up every year for a quality shrink-wrap job. 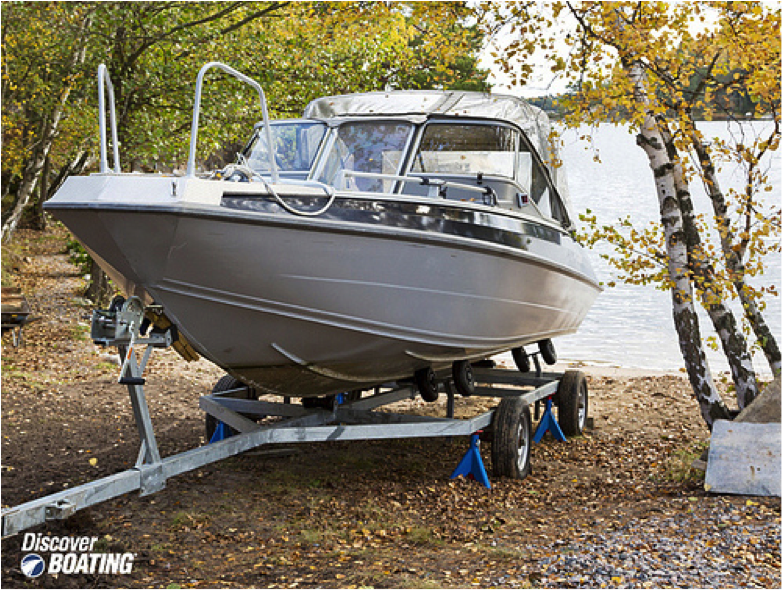 And make sure that when you park your boat for the winter, it’s tilted as much toward aft as possible to allow water drain.